'Trumbo': A Blacklisted Writer, In His Own Words Dalton Trumbo, who wrote dozens of movies and the anti-war novel Johnny Got His Gun, was accused of being tied to the Communist Party in the 1940s, refused to testify before Congress and was later sent to prison. A documentary on his life, based on his letters, will be released in theaters June 27. 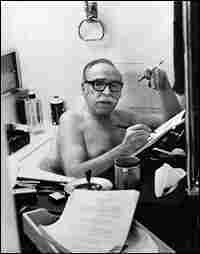 Dalton Trumbo often wrote his scripts in the bathtub. This picture was taken by his daughter Mitzi in 1969. Several famous actors read Trumbo's colorful letters for the documentary, including Michael Douglas. Several famous actors read Trumbo's colorful letters for the documentary, including David Strathairn. The fall of Dalton Trumbo took him from being one of Hollywood's highest-paid writers to a Hollywood pariah. The screenwriter wrote dozens of movie scripts in the 1930s and '40s, including Thirty Seconds Over Tokyo. And his anti-war novel Johnny Got His Gun won the National Book Award in 1939. But in 1947, Trumbo was called before the House Un-American Activities Committee (HUAC) as part of the "Hollywood Ten," who were questioned about their ties to the Communist Party. Trumbo refused to testify and was later blacklisted by Hollywood studios. His story is told in the documentary Trumbo, due in theaters June 27. Peter Askin, who directed the film based on a play by Dalton Trumbo's son, Christopher, tells NPR's Melissa Block that it was a challenge to adapt the play into a film. While he was blacklisted, Trumbo wrote colorful, as well as scathing letters to the telephone company, to his wife and to his daughter Mitzi's principal — which made great fodder for the stage. "The challenge really was to see how long we could sustain both a direct performance of the letters and intersperse that with visual footage [that] was relevant to what was being discussed," Askin says. "What we discovered is that they could be sustained quite well." In the film, an all-star lineup of actors such as Liam Neeson, Michael Douglas and Donald Sutherland read the letters — and the readings are interwoven with archival photos and footage of Trumbo himself. One such scene in the film is of Trumbo at the HUAC hearings, where he refused to testify based on his First Amendment rights guaranteeing free speech. He was found in contempt of Congress and kicked out of the screenwriter's guild. He eventually served nearly a year in federal prison. His son, Christopher, was 10 years old at the time. "It was presented to us as that he believed in one thing and the government believed in another, and he was going to have to go to prison for a short time," Christopher Trumbo says. After Trumbo was released from prison, he went on to have a prodigious writing career under a list of at least 13 pseudonyms — including "Sally Stubblefield." According to Christopher, his sister Mitzi assumed that when people called the house asking for various people, it was for their dad. Under the pseudonym Robert Rich, Trumbo wrote the film The Brave One, which won an Academy Award in 1957. According to Askin, Trumbo didn't pick up the award at the ceremony, and the next day six or seven Robert Riches came forward. Askin says that it was at that point that Trumbo started to fight back, both behind the scenes and in the press. Not everyone was as fortunate — many people attacked during the HUAC hearings committed suicide. In the film, Askin shows newspaper headlines of the suicides. "The HUAC hearings went after the Hollywood profile people because they were our royalty, the American royalty, but certainly it affected people across a landscape of professions," Askin says. Trumbo died of a heart attack in 1976. He and his experience live on in his movies, in his letters and now in this newest documentary about the Hollywood blacklist.